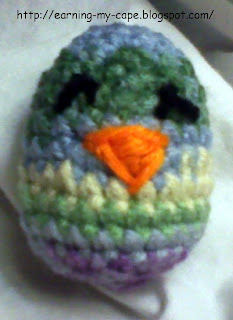 I was poking around one of my favorite blogs, Tutus & Tea Parties, and I saw the cutest little crochet Easter egg chick. I had to make some of my own! They are just too darn cute! I was going to save them as little Easter surprises, but I got "busted". My 5 year old saw them and immediately had to play with them. 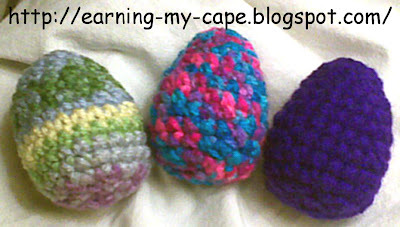 In fact, my 3 youngest girls have been playing with them almost non-stop since I made them. For some reason, my 1 1/2 year old insists that they say, "meow", but ok... if that's what she wants her little chickie to say, then who am I to judge. You can get the original crochet egg pattern at Easy Makes Me Happy. And easy it is! Here are my eggs before they "hatched". I didn't to a super-good job at putting the little faces on them, but I think with a little more practice and a few less interruptions, I will get better. Thank you to Tutus & Tea Parties and Easy Makes Me Happy! LOL! That is so cute! I did have fun making them! I made another last night. Aww those are so cute! 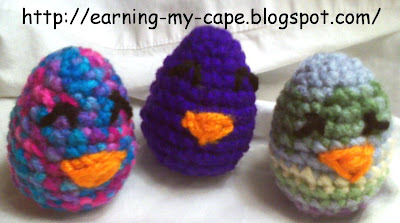 Visiting your from the April Blog Hop in Bloggy Moms! I love the comic book theme for your blog, its really cool! PLease check out my blog, Rural Mama's Sandbox, http://ruralmamasandbox.blogspot.com Have a great day!